Roland Systems Group in partnership with ACE BACSTAGE Company is pleased to introduce the S-0808 Stage Pocket. 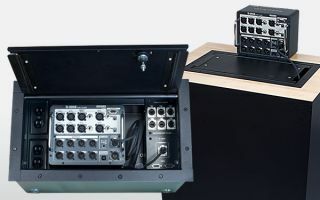 This unique stage pocket is designed for installations that demand clean configurations, flexible storage of the S-0808 digital snake, Cat5e Ethercon ports, power, and customizable audio or video port configurations. The RSS by Roland S-0808 slides easily in and out of a nesting frame that firmly secures it for use while in the pocket but provides the flexibility to take out the S-0808 and place it on stage near the audio source. Adjacent to the S-0808 well is a panel for up to 12 common audio/video/production connectors, and generous raceway for AC power. The orientation of the interior frame as well as the Lid Bezel assembly can be reversed to allow the AC power and/or storage well to be on the other side of the S-0808.